We're up top and looking west, away from the historic core. 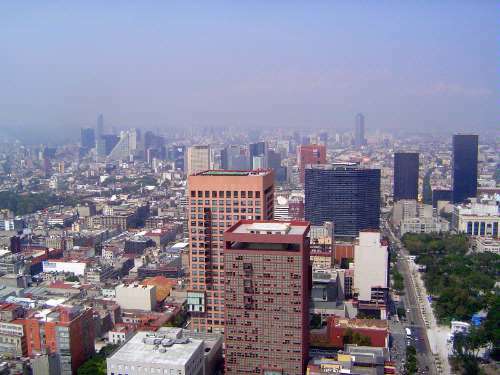 The buildings in the foreground are the Superior Court Building, the Secretariat of Foreign Affairs, and the Hilton; in the distance is the lineup along Paseo de la Reforma, a Paris-inspired boulevard created in the 1860s at the request of the Emperor Maximilian. It is this vast periphery that UNESCO's staff had in mind when they wrote that the world-heritage site they were seeking to protect was the fragment of the city that "survived the flood of concrete which has engulfed" the Valley of Mexico. The park at the lower right is the Alameda Central, established in 1592, though not as large then as it is now, and in a different style.